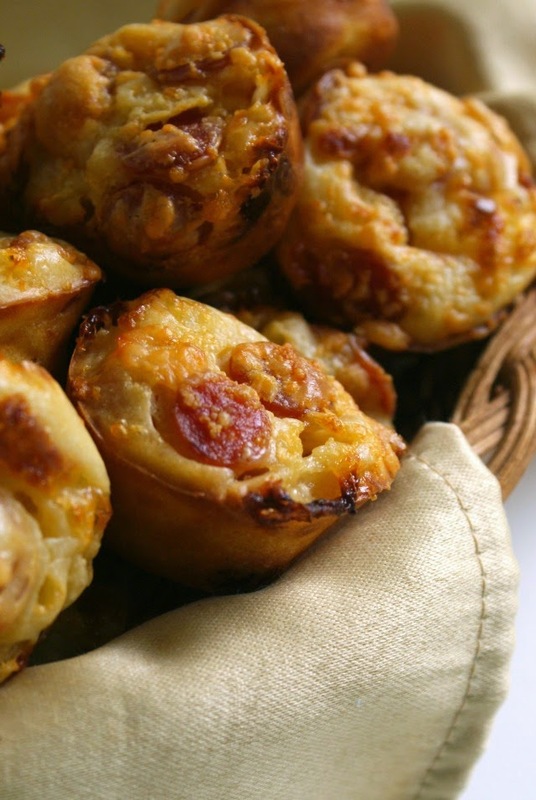 Mini Pepperoni Pizza Puffs are cheesy pepperoni filled pizza bites that are cooked until golden and puffed in a mini muffin tin. They're super easy to make and perfect to serve as an appetizer or an afternoon snack. I am always on the hunt for appetizer ideas. First, because I could eat just appetizer food for every meal and I'd be totally okay with that. Second, because whenever we go to get-togethers I like to bring along an appetizer to share. It would get awfully boring if I brought the same thing again and again, don't you think? I've made these several times and they are the perfect little bite-sized finger food! They bake up into golden puffs that just a little crispy, but soft and cheesy on the inside. Dip them in a little pizza sauce and they're itty bitty bites of pizza heaven! 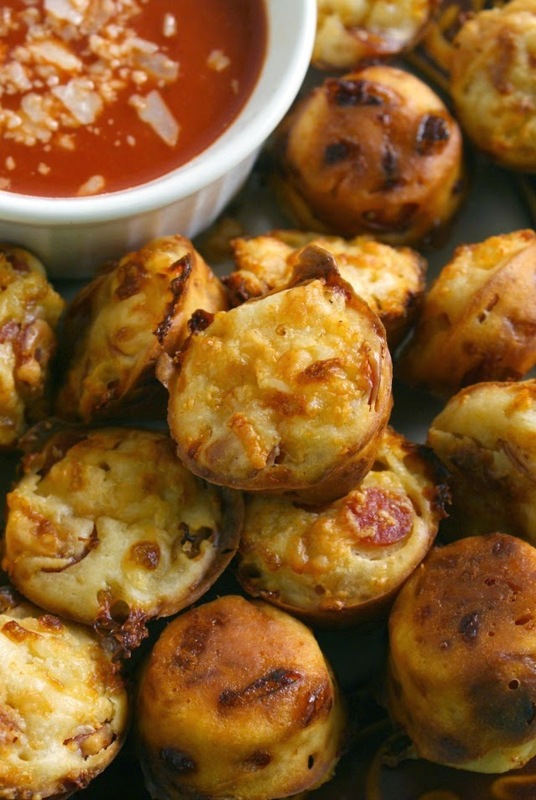 This recipe makes 24 mini pizza puffs, which sounds like a lot, but if you're serving them at a party I would say doubling the recipe would be a good idea. I've made them for my husband's lunch and as a twist on our usual pizza take out night, but they'd also be great for an after school snack for the kids. If I watched football, I'd absolutely make them for a game day get-together. All you football fanatics out there seriously need to make these! All you have to do is mix everything up in a bowl, fill the muffin cups, then bake them up into easy cheesy pizza deliciousness! Very easy and super yum. I know I'll be making these again and again and I'm sure you will, too! Preheat your oven to 375 degrees. Grease a 24-cup mini muffin pan. In a large bowl, whisk together the flour and baking powder. Whisk in the milk and egg. Stir in the mozzarella, pepperoni, and dried oregano. Let the batter sit for 10 minutes. Spoon the batter evenly into the greased muffin cups. Sprinkle with the parmesan cheese. Bake for 20-25 minutes, until puffed and golden. Serve with pizza sauce for dipping. You can freeze these little guys! Freeze in a single layer on a baking sheet then transfer to a freezer bag. To reheat, bake the frozen puffs on a baking sheet at 350 for 8-10 minutes. Source: Adapted from a Pepperoni Pizza Puffs found in Every Day with Rachel Ray. Am I missing when you add in the egg? With the milk. :) You didn't miss it, I forgot to type it! I edited the post. Thanks! Could you use paper cupcake liners? Can you use skim milk instead of whole milk?